Virtual Identity solution brings customers closer to the bank. 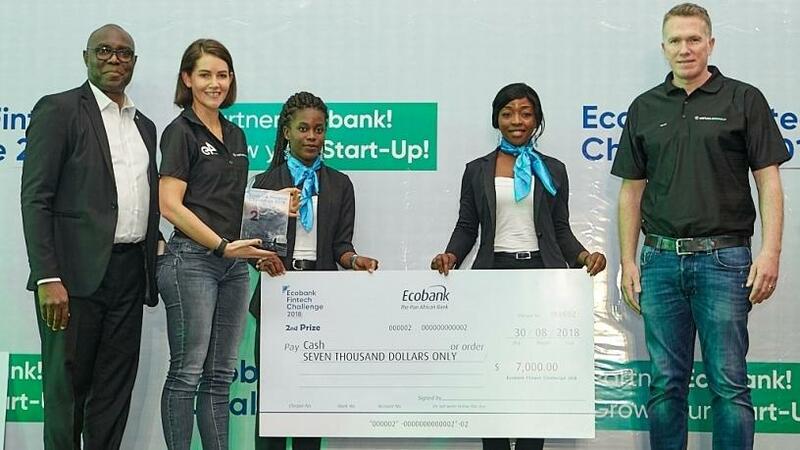 Technology specialist e4 achieved second place in the second Ecobank Fintech Challenge, hosted in Lom'e, Togo. According to Andrea Tucker, R&D Head at e4, the lack of a fully digital onboarding solution across the majority of banks is one of the key reasons behind e4's impressive second position in this Africa-focused innovation challenge. From left: Eddy Ogbogu (Group Executive, Operations & Technology at Ecobank) with Andrea Tucker (R&D Head at e4) and Ryan Barlow (Chief Technology Officer at e4). "Onboarding customers is notorious for its tedious nature, for both the bank and customer. Although it is a time-consuming and expensive process, it is legislated in every country to complete a full KYC exercise on each new customer. Even though we initially developed the Virtual Identity solution for the South African market, Ecobank executives immediately recognised its viability across the continent. The common pain points associated with onboarding customers are greatly reduced, and the solution goes a long way in increasing financial inclusion by making digital account opening and fulfilment a reality," says Tucker. She says it was evident through the quality of the 11 finalists that fintech is alive and flourishing across the African continent. Representing eight African countries such as Kenya, Nigeria, Togo and Uganda, the solutions were engaging and relevant: "It was clear to see that each country on the continent has its own unique challenges. This doesn't mean, however, that a solution developed for Tanzania won't be of value to a country such as Sierra Leone. The Ecobank Fintech Challenge proved invaluable to all when it came to knowledge sharing, while also gaining a deeper understanding of banking Africans. It is wonderful to see that all companies, regardless of size, have an equal opportunity to participate in our country's economy." 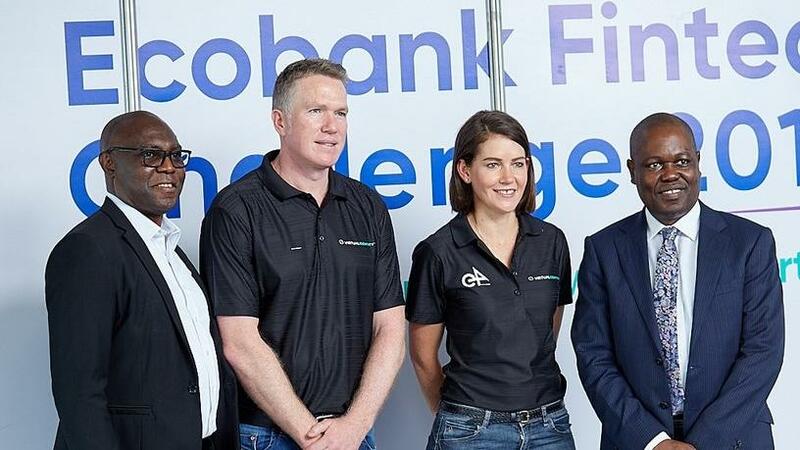 From left: Eddy Ogbogu (Group Executive, Operations & Technology at Ecobank), Ryan Barlow (Chief Technology Officer at e4), Andrea Tucker (R&D Head at e4) and Ade Ayeyemi (Group Chief Executive Officer at Ecobank). Technologies such as mobile and digital platforms featured in the top three winners, while e4's Virtual Identity has the potential to enable the company to fast-track its African strategy. Tucker says Ecobank and other key stakeholders are ready to discuss next steps for the onboarding solution: "We are excited to understand the challenges and explore options for our technology in new countries." Locally, the e4 solution will shortly be implementing its first Virtual Identity solution as part of its package of digital onboarding services. Taking place at one of South Africa's leading banks, Tucker says the company is excited to realise e4's vision of a fully digitised sign-up process for new-to-bank customers by utilising Virtual Identity to verify customers against their identity documents. According to e4, most countries within the African continent face similar challenges: "It is exhilarating to see the amount of young start-ups developing solutions that address country-specific challenges. This level of creativity and innovation is a strong indicator of the drive and willingness they have to make a difference," says Tucker. She says despite this, most African-based start-ups face immense difficulty sourcing funding to grow their businesses. Despite the continent's low penetration rates for traditional banking services, and solid penetration into the mobile phone market, funding isn't easy to access locally. As a leading fintech player, e4 is motivated and committed to assist with improving the levels of financial inclusion throughout the continent by partnering with a pan-African bank such as Ecobank, for the benefit of Africans across the continent. e4 is a technology company specialising in digitisation. By understanding the complexity of a digital journey, e4 partners with its clients to provide innovative solutions that suits their unique needs. Using an omni-channel platform approach, e4 offers a range of digitally inspired services as well as solutions. Working across financial services, data and the legal sector, e4 understands the intricate requirements in these sectors, and uses its expertise to assist clients in effectively managing their businesses through digitisation.